I was not particularly crazy about Ken-Rad mercury lamps because they were just rebadged Westinghouse mercury lamps. But I am proud of my Ken-Rad 100w /W and had to grab this 400w. It is a /DX, made in 1969. I believe it is my oldest merc with the yttrium vanadate phosphor. Casts a beautiful pink color at fire up and a clean white 4000K light at full brightness. Love these Kennies and look forward to the clear one you're sending. That's correct, less pink than most new /DX lamps. That's a plus for sure then in my book. Is it just me or are the late-model /DX lamps worse than older/NOS vintage ones? I would say the modern ones are mostly junk. The phosphors degrade fast, they dim out etc. Except EYE Lighting. I know some EYE lamps still burning brightly at a strip mall which were already there since I moved here in 2007. Eye/Iwasaki...those seem good for sure. I wonder if the Westpointe lamp I have is made by them? It seems well-enough made. I'll post it sometime. 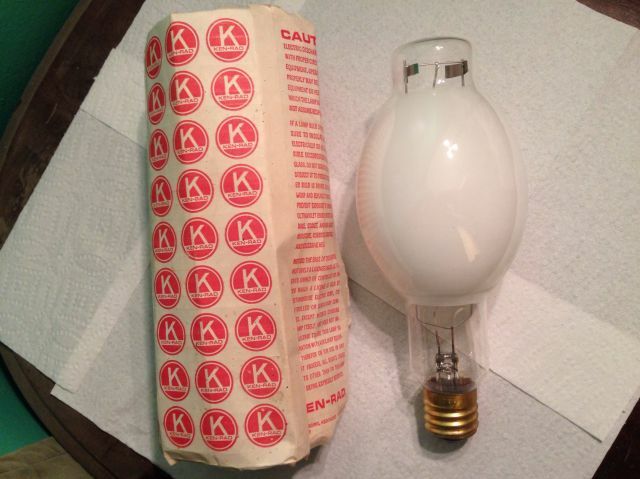 No, that Westipointe lamp was made by Yamao who also made mercs for faux Westinghouse for a while. In your opinion, are they decent? I thought they were, but Don93s had one that literally blew to pieces. Yamao Ningbo mercury lamps have a weak phosphor that degrades rapidly, also just like the Caster brand lamps, they have that habit of failing suddenly (not starting) for no apparent reason. A few years ago I relamped a campground's 250w yardblasters with Yamao (bought as Westinghouse) 250w mercury lamps and not one of the eight I installed is operating today. Most of them just stopped working right around the 2-year mark. One stopped working immediately (like in the first week). I believe this is the reason Westinghouse changed manufacturers again in 2005.
bluehalide, do you know the manufacturer who makes the current faux Westy mercs? They have the American BT shape. Im pretty sure that's Fenghua Noerka Lighting whos making those lamps now for Westinghouse, overall better quality than Yamao. Interesting! Mine seems decently well-made though, better than the GE/Sylvania/Phlips "Rattler" ED-shape lamps...plus it was cheap at around 12 bucks. I have the Westpointe H39KC175/DX as well, and thought it was made by Yamao, I have a genuine Yamao branded sample in 250 watt, too. These Westpointe branded ones seem so be really decent. Maybe they got their stuff together finally? They are pretty nice clearend lamps, too. Yeah, I figured it was just Chinese trash, but maybe not? I think they're the short, really-125w ballast-cooking arc tube, your thoughts?